Just as I promised, I’ve found several very good ideas for using the whey left from making cheese and yogurt. Many recipes for homemade cheese and yogurt encourage pouring this useful by-product down the drain but having a miser mindset, I don’t throw anything away if it can be used. I’m often accused of dividing leftover food and freezing it in ice trays. Guilty as charged. Substitute whey in any baking recipe that calls for water or milk. 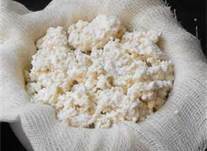 One of my favorite ideas for using leftover whey is to make ricotta cheese. All the recipes I’ve found for this homemade yummy, call for at least one to two gallons of whey. If you are a cheese or yogurt maker you may want to freeze your smaller batches of whey until you have a gallon and they try your hand at ricotta. Let the curds come together for 5 minutes or so, then drain the pot into your cloth-lined colander. The bulk of the whey should drain out within the first 5 minutes. When your ricotta has reached the desired balance of creaminess v. curdiness, scoop the cheese into a bowl and refrigerate until use. Good luck! As soon as I have enough whey, I’m giving this a try. Categories: DIY RECIPES | Tags: cheese, DIY, recipe, recipes, reuse, ricotta, whey | Permalink. I found a really neat recipe for making your own Greek yogurt in your trusty crock pot. There are several steps to the technique and I recommend making it when you have time on your hands and in your kitchen. In other words, make it when you’re not preparing meals. I wanted to see the cost difference and if it was worth the time and effort. I checked the price of Oikos Greek yogurt in my area and it sells for approximately $5.85 for 16 ounces. A serving is half a cup and comes to $1.46 per serving. I can make this recipe for approximately $.50 per serving. It really doesn’t matter the brand of yogurt you use for your starter in this recipe. Use a less expensive brand of plain yogurt to cut costs. Store brand milk will also add to the savings in this recipe. I’ve read that the milk you use can make a big difference in the consistency of your finished product. Whole milk seems to be the preferred product for a thicker, creamer yogurt. I’m not a big fan of low fat milk in the first place, so whole milk would be my choice. 1/2 cup store-bought natural plain yogurt. (Once you have made your own, you can use that as a starter. Add a half gallon of milk to crock pot and cover. Cook on LOW for approximately 2 1/2 hours. Using a candy thermometer, check the temperature of the milk. When the milk has reached 180 degrees, unplug the crock pot, remove the cover, and let it sit for another hour or so. You are waiting for the milk to come down in temperature to between 105 and 110 degrees. When the milk has reached that temp, scoop out 1 to 2 cups of the warmish milk and whisk in 1/2 cup of store-bought yogurt. Then pour the mixture back into the crock pot. Whisk to combine. Put the lid back on your crock pot, wrap a heavy bath towel around the crock for insulation, and place in the oven with the oven light ON. Leave the yogurt undisturbed for 7 or 8 hours, or overnight. Refrigerate the yogurt for at least three hours to allow it to completely cool and thicken. Line a large strainer with four layers of damp cheesecloth and put inside a bowl. Pour the yogurt in; refrigerate for one hour. more hour, strain the liquid again. The whey can be used for making ricotta cheese, butter and other useful things. Otherwise you can pour it out. Reserve 1/2 cup of finished plain yogurt for your next batch. If you wish to sweeten or flavor the yogurt you can add sweetener, honey, vanilla or other flavorings to taste. I don’t recommend adding fruit directly into the yogurt. Store your yogurt in a covered jar or plastic container in the refrigerator. Use it within ten days to two weeks. I use canning jars for most homemade things I’m going to refrigerate and 1/2 pint jars provide two servings. DON’T FORGET, save 1/2 cup of your yogurt as starter for your next batch! Next post I’m covering uses and recipes for using the whey. It’s too useful to pour down the drain. 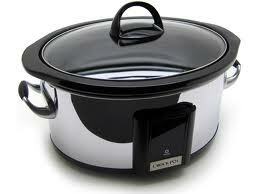 Categories: DIY RECIPES | Tags: Crock Pot, DIY, homemade, milk, recipe, yogurt | Permalink. Tomorrow is Thanksgiving and though I was saving myself for tomorrow’s feast, I was hungry today. Yep, today is Wednesday and I have spent the day buzzing around Christmas decorations wondering if decorating is worth it this year. Living alone, I sometimes wonder if all that hullabaloo is worth it. Since I haven’t decorated in a couple of years while my Mom was sick and consequently passed away, I find that maybe it’s time to shake off the doldrums and actually get in the spirit. While eating wasn’t on my mind much of the day, I found that by 2:00 pm my tummy was speaking in low growls and prodding me to fill the void. I had thawed half a chicken breast last night and was wondering how in the world I would make this preparation different from my daily intake of chicken. Opening the refrigerator I spied a small jar of orange marmalade on the shelf with only a few tablespoons left in the bottom and it was sitting next to the French’s mustard bottle. Humm, I wonder if that would create a good sweet and sour sauce for my chicken? Well, I browned my chicken really well in a small non-stick skillet. Into the marmalade jar I squirted a few squirts of yellow mustard and a few healthy shakes of ground red pepper. When the chicken was almost cooked through, I coated it with my concoction. When it started to get really brown, I added about three tablespoons of water and placed the lid on the pan and reduced the heat to medium. It cooked for about fifteen minutes more and I then removed the lid. I continued to cook it until the sauce became a thick and an almost transparent, beautiful deep orange glaze. I continually basted the chicken breast until it was too thick to bother. Boy was I surprised! The result was absolutely the most delicious lunch I’ve prepared for myself in a long, long time. I enjoyed it so much that I felt compelled to share this with you all. I feel sure that many, many people have already tried this but humor me please, I want to gloat on “my” creation for a while. If you need a depart from the traditional Thanksgiving food that may last until the middle of December, please give this a try. Since I’m not recipe writer, I’ll leave it up to your taste buds to prepare it to your taste and in the quantity you need. Mine was half a breast, about a quarter cup of marmalade, a few squirts of mustard and a healthy shake of ground red pepper. Yum, Yum Yum! It never fails, when I improvise with ingredients I have on hand, the results are almost always amazing. 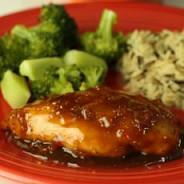 Categories: DIY RECIPES | Tags: chicken, glaze, glazed chicken, mustard, orange marmalade, recipe, recipes, red pepper | Permalink. Make Your Own and Save!! 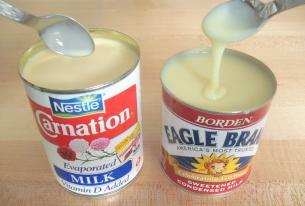 This is a great tip for making your own sweetened condensed milk. The price of this product has skyrocketed lately. I use a lot of this during the holidays so having this DIY recipe is absolutely terriff! In small bowl combine the powdered milk and the sugar. Set aside Put hot water into blender. Start blender. With blender going pour in the powdered milk /sugar mixture. Blend until smooth. This recipe equals one can of store bought condensed milk. Categories: DIY RECIPES | Tags: DIY, knock off, recipe, recipes | Permalink.